"I just wanted to say a huge thank you for coming in and sharing your stories with our students this morning, we have had lots of students and staff telling us how much they enjoyed it." Adele Wooldridge, Totton College. l The stories in this haunting collection are as ancient and modern, powerful and fantastical, ambiguous and ambivalent as the ghosts they feature. Here you will find tales of headless horses riding moonbeams, an entrance to another world on Marrowbones Hill, drowned sailors and ghost ships, and a girl riding pillion on a motorbike driven by her dead boyfriend - all told in the distinct voice of noted storyteller Michael O'Leary who, for years, has wandered the highways and byways of Hampshire, immersed in the layers of ghost stories that have accumulated in this ancient county. Richly illustrated with original drawings, these tales are perfect for reading under the covers on dark, stormy nights. 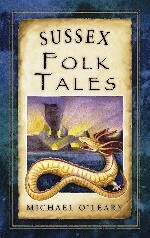 With screaming demons in Wealdon copses and dragons lurking in bottomless ponds, the folk tales of Sussex truly represent the diversity of the area. Meet knuckers and willocks, mawkins and marsh monsters, the Piltdown Man, Lord Moon of Amberley Swamp and the princess of the Mixon Hole. 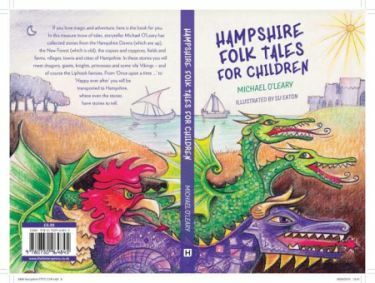 Featuring dark tales of murderous kings and commoners, wild women, screaming skulls, galloping plague coaches, dragons dancing themselves to death, giants, and wandering corpses, combined with humorous stories and evocative tales of love, lust and passion, this book takes the reader beyond the written page and reveals the wonders that lie within the Hampshire landscape. The future holds "Sussex Folk Tales"
If you live in the Southampton area, tune in to Unity 101 to catchMike telling his two minute stories throughout the day. "Amongst other complimentary comments students told me you were 'funny' 'unique' and that they felt 'brought into the story'. One student was 'expecting someone with a book just to sit down and read it' and was delighted that this was not the case. Another stated that you were very good in how you 'expressed the details of the story'." "To the average parent, the news that a 'storyteller' is coming to the school won't exactly set the breakfast table alight with expectancy. Such an event is usually seen as a quaint optional extra, doubtless arranged to give the teachers a chance to catch up with their marking. 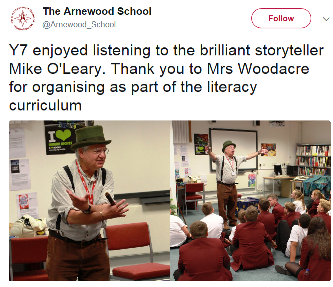 But at Chamberlayne Park School, a 'challenging' inner-city comprehensive in Southampton, the visit of storyteller Michael O'Leary is viewed very differently. There, O'Leary's sessions play a pivotal role in the English department's strategy to tackle children's literacy problems." Michael O'Leary is an experienced storyteller and teacher based in the Southampton and Portsmouth area, in the county of Hampshire in the UK. 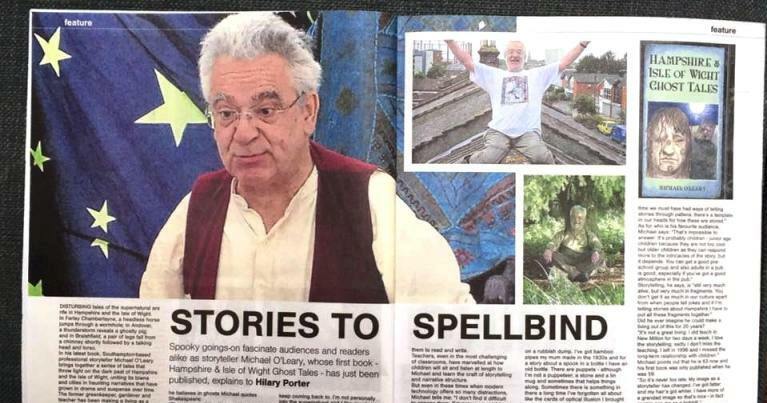 He shares stories with children, teenagers and adults in homes, gardens, schools (both special and mainstream), colleges, universities, prisons, pubs, clubs, forests, fields, museums, libraries, hospitals and shopping centres. 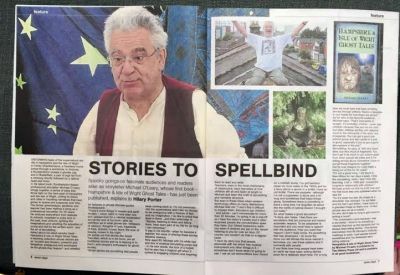 He has featured on BBC Radio Solent, Radio Bristol, Southern Counties Radio, RTE, Radio Northern Ireland, Radio Art Asia and Unity 24 Community Radio. "My day with Michal O'Leary was a laugh. He told us two funny stories that got everyone giggling. He especially likes telling stories about dragons. I don't know how but he always had a trick up his sleeve to make us jump......When it was time to go, everyone was sad. We wanted one more story but that was it. 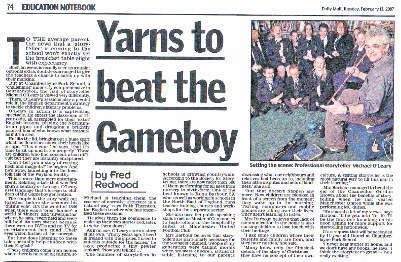 Alex"
When in mid-life he became a teacher, the value of sharing these stories became obvious. "Stories, listening to them and telling them, have been part of my life for as long I can remember." "Students described your session as very enjoyable, useful, brilliant, inspirational and a good de-stressor!" Why not attend Mikes Next Public Event......? 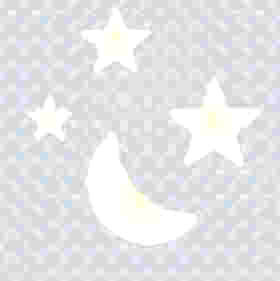 Click here to find out where it is! Take a look at Forthcoming Events and Events Past for ideas for your own event!